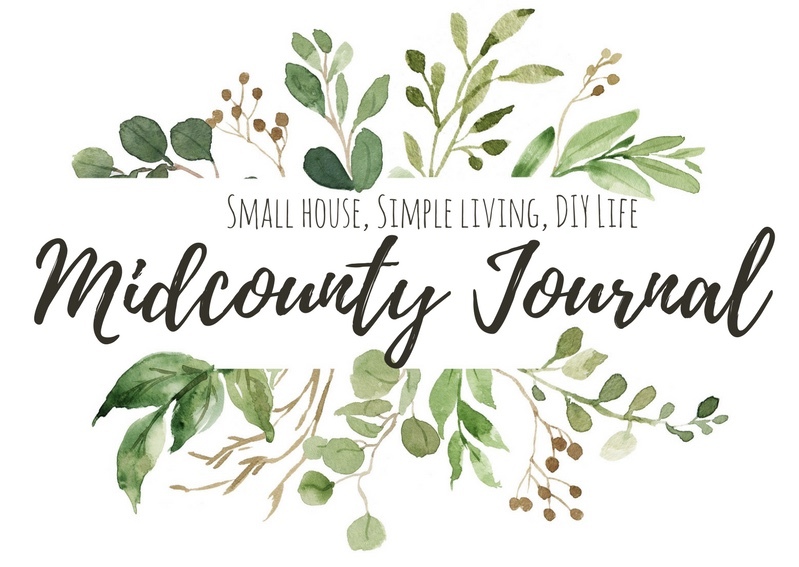 I’d love to welcome you to this leg of the Early Spring Home Tour blog hop! If you’re coming from Jackie’s home at sawdustangel.com then I’m sure you’re already feeling inspired! I am beyond excited to have teamed up with these fabulous ladies to bring you some beautiful homes all decked out for springtime! It might say “Early” but spring’s just around the corner and it feels so so good to bring the house back to life with pops of green, florals (faux plant lady here! Lol!) 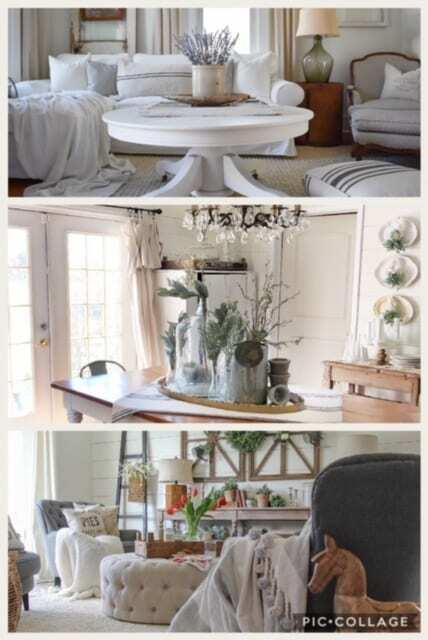 and other springy touches 🙂 My thinking or concept for our home this season is “a farmhouse cottage in spring”. 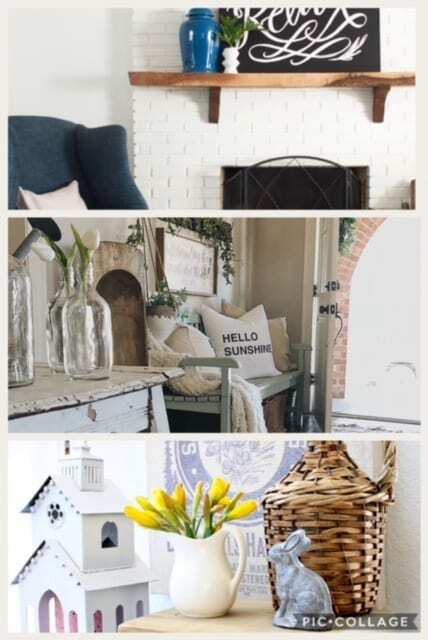 Along with the addition of greenery and florals I also added lots of cozy farmhouse textiles, cute farmhouse prints, and sprinkled in some galvanized goodies and vintage finds too. I’ll try to link as many products as I can for ya! As always feel free to message me with any questions you may have in the comments! This is the current view from my front door 🙂 The magnolia wreaths (which I’m not seeing online, but they were still in store last week) on the shutters and the lavender in the crock are from Hobby Lobby. I caught all the greenery there when it was 50% so creep those sales ads (or you can always use your 40% off coupon too). This corner is maybe my favorite spot in our whole house! I mean that chair, right?! Check out the story behind that chair HERE. The spot got sweeter when I found this adorable grain sack pillow on Etsy. I love how authentic it feels and just fits with my whole farmhouse in spring vibe because you gotta feed those spring babies on the farm! Haha! Okay I’m a dork! Any who, I also want to take a minute and just obsess over this lamp I got from Pottery Barn! I AM IN LOVE! The subtle green it brings to the space is just perfection! Also I stalked it and caught it wayyyy on sale so be watching if ya want a good deal! Ed has called me the crazy crock lady and I’ve dubbed myself the faux plant lady and this seemed like the perfect season to combine those 2 truths. So naturally when I snagged this adorable little bayleaf topiary from Hobby Lobby I tossed it in a crock 😉 The other pops of greenery (lambs ear) and galvanized containers are from IKEA. The little terra cotta pots were underneath a friend’s porch last year. All we had to do was brave the bugs and they were ours, good thing Ed is brave lol! I went ahead a stuck Gertie the goat in our vintage laundry hamper so I can enjoy her sweet face while were on the sofa 🙂 It’s the little things, right? The next space I’ll be sharing on this early spring home tour is my dining area! I had so much fun creating this simple tablescape using mostly things I already had. This winter I found that picnic basket at a vintage shop $3 and knew it would find a place here this spring. With a picnic vibe going on I wanted to keep the table very casual. I put all the dishes in the basket instead of setting them out. I also brought in some of my white pitchers and creamers to surround the basket. The little topiaries are from Hobby Lobby and I put them in some of my free weathered pots. My favorite part of this centerpiece is the lavender. I ran in to Hobby Lobby (hoping for some spring inspo) while Ed chose to stay in the car for some odd reason 😉 And when I came out with an arm load of lavender he was genuinely surprised! You see I’m not real big on purple, but it’s so realistic and when I saw it I felt the inspiration I was looking for 🙂 I love how cheerful it’s made our whole house! The little stool was a vintage steal for $3 and the ticking table runner can be found HERE. The sweet little rosemary wreath is from Hobby Lobby (are you seeing trend here?) on sale for $10! One of my very favorite spots in my house right now is our open shelving area. Vintage finds make my heart sing and this space is full of them! Plus this primitive cabinet is still one of my favorite yardie finds ever! Starting with the top shelf. The big pitchers on either end are from Target the rest are yard sale or antique shop finds. The sweet little wooden berry boxes I have scattered on here are from a yardie as well for $0.25! Next shelf = more berry boxes, old window, vintage wire basket, crock, and cool meat grinder I found for $5! Bottom shelf = berry box on vintage scale, vintage flour sifter, and THEN my favorite thing! The cutest little sheep print ever! This is the one I mentioned before! $5 at an antique shop with a $5 frame from that same shop. I feel like this art just makes the whole space so cozy! Love it! Also next to it is a vintage glass jar and…you guessed it more berry boxes! Lol! ** Side note** I almost put the cow print in here but Ed said that would be a bit morbid with the meat grinder overhead lol! The last space I’ll be sharing with you today is our bedroom 🙂 This room is such a retreat for us at the end of the day and I like to keep it really simple and cozy. Of course I added some lavender in here too on each side of the bed. Then I simply added a Target dollar spot galvanized bucket with some greenery in it as well as a vintage washtub with some white hyacinths from Hobby Lobby. I mean for real, I was like well done Hobby Lobby! Just take all my money this season! Lol! The decorative pillow and throw are from IKEA and our quilt (that we’ve enjoyed for awhile now) is from Target. I hope you enjoyed this leg of the Early Spring Time Tour and I know you’re just gonna love the next one! Now hop on over to see Karlee’s gorgeous house at karleebowman.com 🙂 Keep following the loop, trust me you don’t wanna miss out! Also be sure to find each of us on Instagram! We’d love for you to follow our journeys even more closely there! Amanda…Your house is adorable!…I saw the sweet stool you bought, at Penny Lane and pondered buying it…but I left it for you! Yes! Thanks so much for leaving it for me! You’re the sweetest! Amanda, this is all so beautiful my friend! I am having major crock envy!! And the dresser your TV sits on is perfection. I too, love grain sacks–it provides such a cozy time worn and tattered feel. What a lovely spring home you have, it is an honor to be joining alongside you on this tour. Thanks for the awesome inspo!! Brendt you’re the absolute sweetest! Thank you so much for your kind words! The honor is mine girl! Oh I’m so excited to check out your site! You’re very kind and absolutely made my day! I just love how cozy your home is! 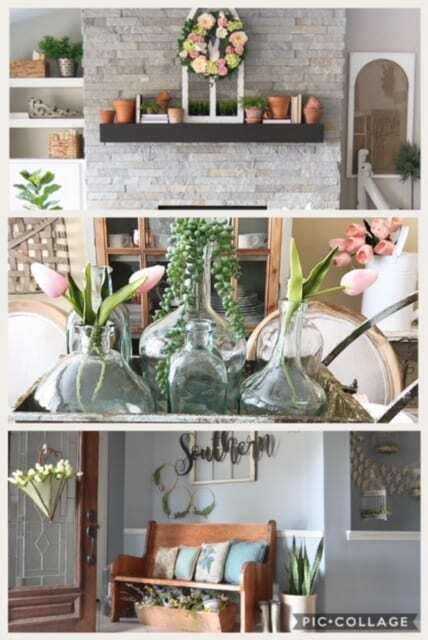 And all the spring accents are so refreshing. Such a beautiful tour! Oh my goodness! Thank you so so much! You made my day! Amanda your home is just lovely! I too adore Hobby Lobby but you have found some great finds that I have never seen! I think we would have fun shopping together! Thanks for sharing your home with us! We’d get into some trouble! Haha! Thanks so much! Amanda your home is absolutely stunning! I love all your vintage treasures and spring touches! I am truly inspired by your beautiful home! Pollie this sweet comment made my entire day! And believe me the feeling is mutual! So grateful to be a part of the tour with ya! Thank you so much for stopping by and checking it out! Have a great weekend! I love the picnic basket stuffed with lavender! Looks great!